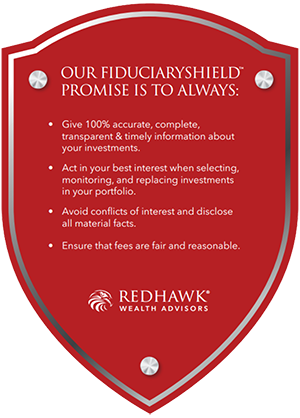 Redhawk provides customized investment advisory services to assist clients in achieving their investment objectives while fulfilling our fiduciary obligations. Our investment philosophy is very simple. We strive to capture more of the market's upside during good times and avoid more of the market's bad times. We deliver this defensive risk management strategy to money management through a number of products and services. We believe that missing severe market drops is essential to investment success, because the less investors lose during downturns, the less they have to make up before their gains become true gains during a rebound. Making money is important, but protecting that money can be just as important. We believe our defensive active management strategies set us apart from many investment managers who employ buy-and-hold methodologies. We don't pretend to predict the market, because that would be foolish and impossible. Rather, our proprietary processes are based on momentum trends, analytics, and discipline. Our data-driven models recommend investment changes based on market conditions, and we make changes to the Redhawk portfolios based solely on these indicators. What are our fiduciary obligations? Our fiduciary obligations are to provide clients with investment management solutions that are solely in their best interest. We do not have affiliations with broker-dealers, investment companies, or other financial institutions so we are totally unbiased with our investment recommendations. We receive compensation for investment management services solely from our clients so as to avoid any conflicts of interest. Our mission is to provide customized investment management services to assist our clients in achieving their investment objectives. We are an independent, fee-based investment manager, aligned solely with the best interests of our clients. Our professionals have worked together for many years providing fiduciary investment management services to clients. Our knowledge and experience is combined with appropriate advanced degrees and credentials. We are fully transparent and only use investment vehicles that have a reasonable cost structure and no hidden fees. What type of investment management services does Redhawk offer? Non-Managed Account – An account whereby the client has total discretion. Redhawk executes the trades based on direction from either the advisor or client. The client pays for all transaction and trading costs and there is no minimum account balance required. Managed Account – An account that can be invested with various well known sub-advisors selected and monitored by Redhawk. Redhawk has full oversight over the sub-advisor's portfolios and Redhawk executes the trades on behalf of the client based on signals provided by the sub-advisors. Wrap Account – An account that is invested in an asset allocation strategy that is managed by Redhawk. This account is an all-in-one fee account that includes the investment management fee, advisory fee, and all transaction and trading costs. Redhawk pays for all trading and transaction costs. Open Investment Platform (“OIP”) – An account that enables the advisor to have full-discretion and fiduciary oversight of the client's account. The advisor is responsible for executing trades and managing the account on behalf of the client. What is our fiduciary process? In a highly volatile investment world, how can you build a plan for long-term success? What does it take to sift through thousands of investment opportunities and identify the relative handful that compliment your specific goals, time horizon, and risk tolerance? That's why Redhawk has a formal investment committee called the Redhawk Investment Committee (“RIC”) that meets weekly to select, monitor, and replace investments. The RIC's overall goal is to always be invested in the top sub-categories and funds within those categories. How do we select investments? The selection of an investment is a disciplined process and Redhawk analyzes all of the major asset categories during the selection process. We use our proprietary scoring methodology to determine the top performing sub-categories to include in the portfolios. How do we monitor investments? The ongoing monitoring of investments is a regular process and monitoring confirms that the criteria remain satisfied and that a fund continues to be appropriate. The Redhawk Investment Committee uses the bubble chart (see below) to monitor the funds on a weekly basis. The funds are scored based on how they perform against their benchmark. Funds are categorized based on if they fall in the keep zone, watch zone, or replace zone. How do we replace investments? An investment can be replaced for many reasons such as poor performance, legal sanctions, closure to new investors by the investment provider, or that it may not be suitable for clients. Severity 1 – Keep the fund and limit the amount of new assets that can be placed in the fund. This may have a temporary timeframe or a permanent timeframe. Severity 2 – Keep the fund and freeze the assets in the fund and do not allow any new assets to be invested. This may have a temporary timeframe or a permanent timeframe. Severity 3 – Terminate the fund and replace it with a fund that is similar to the terminated fund. There are a couple of options for the assets to transfer to a new fund. How do we communicate to clients? We are a big believer in proactive and frequent communication. We want to let clients know what is going on with their investments. We send out a weekly email with market commentary and investment signals on the portfolios. Clients can see exactly what we are doing within their portfolios and most importantly why. We email a monthly portfolio monitoring bubble report that shows how the underlying investments in the portfolio are scoring. By following our investment process, we strive to ensure that all of the investments in the portfolio are in the “keep” zone. We make available a quarterly performance report for clients. The report includes transactions, performance, and other important information pertaining to the account.